Step 1 Place the diced tomatoes in a colander for 10 mins to drain its juices. Meanwhile, prepare the remaining ingredients. Step 2 Slice the shrimp horizontally through the middle (see the picture). 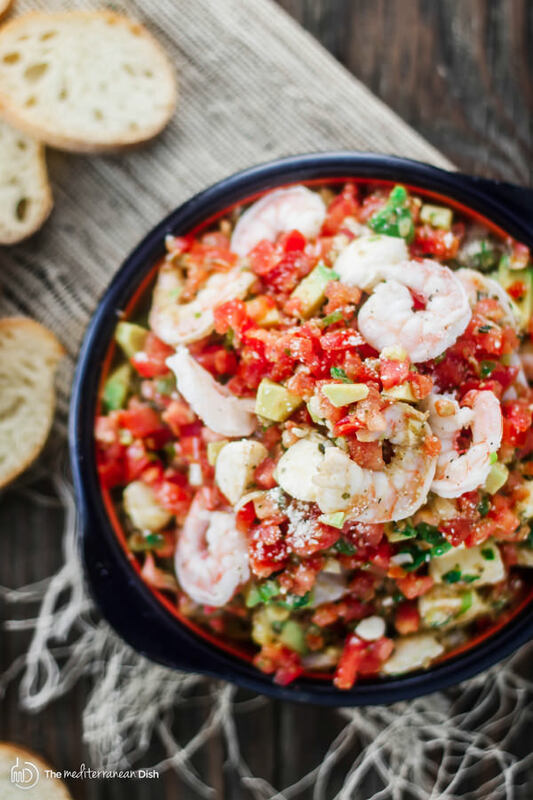 Step 3 In a large bowl, combine the tomatoes, shrimp, green onions, avocado, garlic and mozzeralla. Season with salt and pepper. Add the lemon juice, 2 tbsp olive oil, basil pesto and Parmesan. Toss gently to combine. Step 4 Transfer the shrimp bruschetta into a serving bowl. Cover and refrigerate for 1 hr. When ready to serve, toss the bruschetta gently to freshen. Toast the bread slices and serve next to it. Enjoy! Not your average bruschetta recipe! For a special twist, I added shrimp, avocado, and good quality basil pesto.